Much like quarterbacks in football, goalies have a huge following in the hobby. 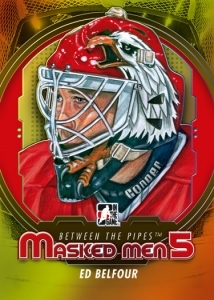 2012-13 In the Game Between the Pipes once again honors the men behind the mask. Like past releases, the set mixes the position's history with current and future stars. Every box comes with at least two autographs and a pair of game-used memorabilia cards. Goaliegraphs autographs include signatures from players who laid the foundation of the position as well as emerging greats from the ranks of the CHL. In the Game is promising another expansive checklist similar to what they've done in previous Between the Pipes sets. Autographs fall 1:7 packs. Game-used memorabilia cards fall under several banners. Vintage Game-Used Jersey look to the past, offering some rarer pieces. Game-Used Patch cards deliver multicolored swatches that are bigger than what collectors find in most other sets. 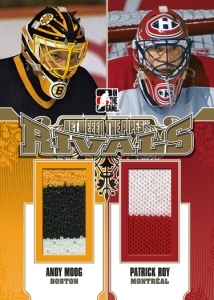 Rivals focuses on players who squared off against one another, giving collectors two swatches. 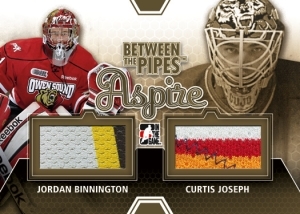 Aspire is another dual-swatch set, pairing up-and-coming goalies with someone they looked up to. Game-used memorabilia cards combine to fall 1:8 packs. Masked Men 5 sees the return of the popular insert set. This year, the cards mix detailed artwork with refractor card stock. Every box has three Masked Men 5 inserts. 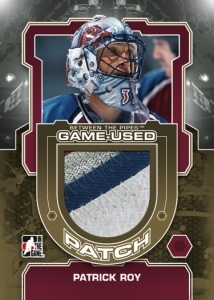 Packs of 2012-13 In the Game Between the Pipes Hockey that don't have a memorabilia card come with a decoy that doubles as a He Shoots, He Saves points card. Collectors can save these to redeem for exclusive cards. In the Game has lowered the number of points required to cash in to 150 points. The decoys can also be used as puzzle pieces. 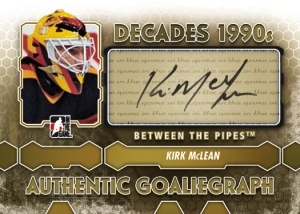 Click here for the full 2012-13 In the Game Between the Pipes Hockey checklist. 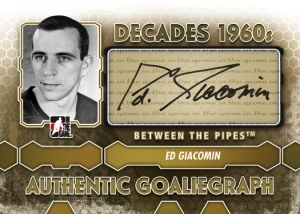 Good: Expansive list of goalies for the both base set and inserts, ITG continues to produce some of the most attractive memorabilia cards in the hobby, Masked Men 5 inserts look great. Bad: Many base set photos are poor quality, without names or numbers it is difficult to figure out the puzzle pieces. The Bottom Line: ITG continues to produce some of the most focused sets in the hobby. Dedicated strictly to goalies, 2012-13 In the Game Between the Pipes covers netminders past and present. It's a well-rounded set that delivers an expansive base set, several attractive autograph and memorabilia cards, and one of the coolest looking base insert sets in hockey this year. The 2012-13 ITG Between the Pipes base set is a mixed bag. Combining prospects, current players, retired stars and capped off by a handful of record holders, there's no denying the set's depth. This is further emphasized by the in-depth card backs. And while the overall look and design of the base set is good, there are lots of photos that should not have been used. The prospect cards are fine, but when you check out the retired players, many are extremely soft and blurry. It's likely a case of limited picture selection, blowing the image up and cropping. No matter the reason, these handful of images don't make for attractive cards. Now that ITG has been producing Between the Pipes for a number of years, a solution may be to cut the size of the base set. Because so many of the retired players have been covered, the switch could be made to make the base set entirely prospects and save the current and past players for the inserts, autographs and memorabilia cards. That being said, everything else about the look of the set is strong. The memorabilia cards and autographs don't stray far from other ITG sets. And while that's not a bad thing, part of me wishes for something a little different. One other small change I'd like to see is some sort of label, number or name on the back of the decoy card puzzle pieces. A box yields a stack from several different players. Unless the pieces go side-by-side, it's tough to tell which belong together. A small number or name would make for an easy fix. It would also help those looking to build a set compile a list that's easy to understand. My favorite cards in the release are the Masked Men 5 inserts. Last year ITG opted for a die-cut design. This year it's a mix of artwork and a sparkled foil background that's similar to Panini's Cracked Ice cards. The Masked Men 5 cards provide some instant pop. Their unique look is exactly what a great insert should be. If you're a fan of goalies then you're likely to be impressed by the checklist. The base set's historical take is fantastic. For a lot of the prospects, it may be some of their only cards. That is unless there's a sweeping goalie illness that takes out nearly 100 goalies ahead of them on the hockey food chain. Some will fight their way through, but most will be peaking in the minors. But that's a big part of prospecting. The records that come toward the end are fun. Some are obscure enough that you'll be able to impress your friends. The expansive lists carry over to the autograph and memorabilia sets. Many may not be the biggest superstars, but Between the Pipes is intended to be a celebration of one position. To limit it to the best of the best wouldn't be doing collectors a service. To be expansive, like it is here, you need some of the lesser stars. 2012-13 In the Game Between the Pipes falls in line with the company's other products. There are plenty of superstars as well as lots of lesser stars that don't necessarily have a ton of autographs or memorabilia cards. The lack of quantity and print runs on the cards themselves continues to be an issue as it forces collectors to look elsewhere to find out if they have a rare card or something more common. 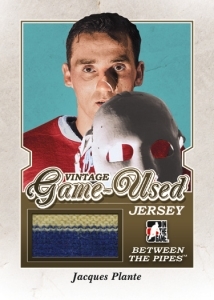 I definitely prefer that the high-end looking Masked Men cards are the only inserts versus the plain inserts that have been in other recent ITG sets. It's a matter of less is more. By making these inserts standout, there may not be as much overall variety, but what's there is much more memorable. I love pouring through historical sets like this. They provide a lot of info and history, they look great (for the most part) and there are lots of hits. ITG's mid-range products offer a ton of balance. They stress collecting over the big-dollar cards. So even when you end up with the bare minimum, there's still plenty to go through and appreciate. Does ITG have NHL license now or will the cards not have team logos? JWP � ITG does not have an NHL license but they do a very good job of working around it. They do have a CHL deal, though, for junior players. The hits are often outstanding but I have a tough time getting into the sets without the full NHL license and logos. I do like collecting the Juniors, though. top notch Canadian product. top prosuct. a must. As a goalie fanatic, I love this product! Great hit ratio, great inserts, and you have a chance of getting some real high end cards like Complete Logos made to order redemptions!